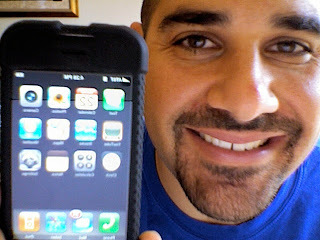 Brett Goffin's Blog: My iPhone! I received my iPhone in the mail on Friday night. 2 weeks of waiting is over... and let me tell you, it was worth the wait! I've known that being the first generation technology is probably a mistake, but for some reason - I had to have it. This said - after 2 days of ownership - I'm proud to proclaim that the iPhone is as cool as advertised. Everything is typical apple: Sleek design, light weight, enormous colorful screen, nifty and futuristic sounds, intuitive interface and just overall coolness. The publicly discussed drawbacks are there: slow internet connection, weak battery and expensive price-tag. But as I've never had fast internet connection on my personal cell phone, I am OK with plugging the phone in everyday, and never spend much money on myself -- I am accepting of the drawbacks. The reaction people have (including random strangers), is pretty interesting to witness. I went to buy a suit today -- and the salesman wanted to talk more about the phone than he did about the prospective purchase I was going to make. The interface will take me some time to master, such as the touch screen keyword and shortcut type tricks -- but all-in-all -- I'm loving my new phone... I'm sure I'll keep you posted.